On the bus to Tunbridge Wells today I became aware of a dad with his toddler sitting at the front of the upper deck, both father and son playing at being bus drivers, with their pretend steering wheels and pretend brakes, laughing and shrieking. It made me smile and reminded me of my own childhood and the way that we create our own stories and roles through play. We can become anyone. We can do anything. Our imagination enables us to explore new worlds. One of my favourite toys when I was a child comprised of a host of plastic farm animals. My model farm provided me with hours of fun. I made up stories and adventures for the world I had created, and my imagination enabled me to become the tiny plastic figure with pigtails and jodhpurs with the cute Shetland pony. I made choices about what happened to my characters and landscapes, controlling their destinies in a way that isn’t possible in reality. Like being a storyteller. And I thought of what playing had in common with writing and my reasons for writing, for creating stories. I sometimes wonder where this need comes from, why engaging our imaginations is so important. I used to daydream a great deal as a child. It was all practice for writing my stories. I’m still practising. 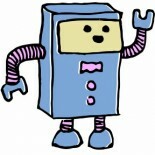 This is my last post of 2012 for Creatabot – here’s to a creative 2013! Her trilogy of Matty Horse and Pony Adventures books for pre-teens and teens (and nostalgic older readers) are available for kindle on Amazon.co.uk. All profits from these stories are going to Redwings Horse Sanctuary. Echoed, Barry! Thanks! I still enjoy daydreaming – and at least I have more control over them than my sleep-dreams. This entry was posted on 21/12/2012 by futureme50 in Editorials and tagged art in Kent, art zine, creatabot, Creatabot zine, creation, creative, creative Kent, creative magazine, creative South East, creative website, creative webzine, creative writing, creative zine, dreams, indie art, Jane Ayres, online art magazine Kent, playing, stories, storytelling, the arts in the South East, writer, writing.